Taekwondo is Martial Arts developed over many thousand years of history in Korea. The Martial Arts training through Taekwondo emphasizes training of mind and body, promoting a wholesome person with well-balanced mental and physical strength and wisdom. In traditional Taekwondo classes, strong emphasis is placed on the training of the mind as well as the body, such as mental concentration, patience, discipline, self control, self confidence, loyalty, modesty, respect for others, harmony, peace, love, mercy, and compassion. Oriental Martial Arts College) "The Young Tigers" program and its sister program "The Little Tigers" Program were created for children by Senior Grand Master Joon P. Choi, 9th Dan black belt, who is the founder and president of Oriental Martial Arts College (OMAC) and Moogong-Ryu Martial Arts System. These programs were further enriched by Instructor Matt Pasquinilli (the author of "The Child Whisperer"). Meditation, Warm-up and Stretch Exercises, Breathing Exercise and Stance Development, Self-Defense Technique Practice (hand & foot techniques), Self-Defense Technique Application (Moogong-Ryu Taekwondo forms, step techniques & sparring), Mental & Physical Concentration Development and Mental Training. The Young Tigers Taekwondo Club is a branch of Moogong-Ryu Martial Arts Association & Oriental Martial Arts College, headquartered in Columbus, Ohio. Branch schools of OMAC are located in US, Canada and Europe. The Wilmette Young Tigers Taekwondo Club classes are offered through Wilmette Park District Sports Program. Classes are held at the Wilmette Park District Community Recreation Center (CRC), Wilmette, IL, USA. Instructor Dr. Lucy Park and Grandmaster Ho B. Kim started the club in 1998 and they currently teach the classes. The program place emphasis on developing essential skills for good physical fitness through martial arts training. 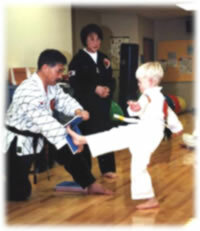 Basic techniques of Taekwondo, combined with deep breathing exercises, help children to develop proper posture, concentration and coordination. Practice of proper manner helps to develop courtesy and self-esteem and practice of mental and physical focus helps to develop self-control. Click here for class information.